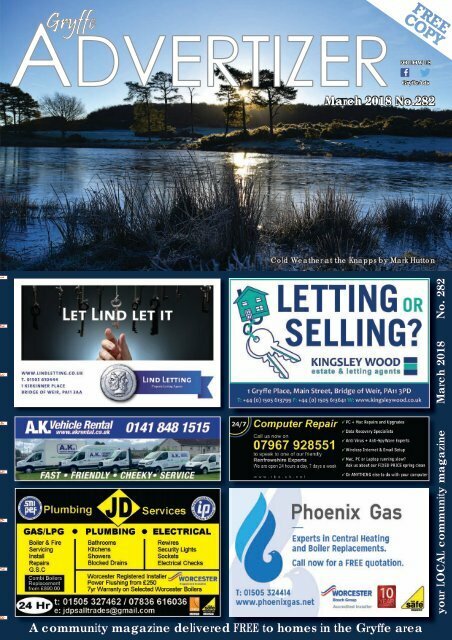 The Advertizer - Your local community magazine to the Gryffe area. The Advertizer is a local business directory including a what's on guide and other local information and an interesting mix of articles. 56 the advertizer PROPERTY Trades and Services Property to let TUITION Business SITUATIOns Vacant MISCELLANEOUS HEALTHCARE/ BEAUTY CHILDCARE Houston registered childminders. For an informal chat to find your best childcare, call Elizabeth Waddell T: 01505 614925 Kilmacolm/Quarriers area registered childminders. P/time or F/time vacancies for u-5’s and after school. T: 01505 873839. TRADES & SERVICES - CARS FOR SALE - PROPERTY & HOLIDAY HOMES Black & White ads only Lineage: up to 20 words £13.00* Boxed ad: £7.50* per column cm Photo: add £7.50* (colour) *all prices subject to VAT deadline date for our april issue - Friday 16th March - You don’t want to miss it! !